Thank you Cricut for sponsoring this post on How to Make Stickers Using Cricut Print then Cut. All ideas and opinions are always 100% my own. 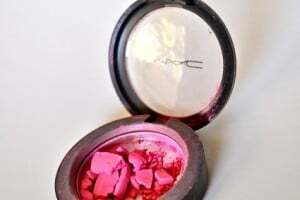 Post contains affiliate links, please see my disclosure policy here. I can’t wait to share with you how to make stickers using the Cricut Print then Cut feature today. I’ve been obsessed with stickers ever since elementary school (I even founded a sticker club in 5th grade), and I can’t believe how easy it is to make my own stickers using Cricut print then cut on my new Cricut Explore Air™ 2 machine. 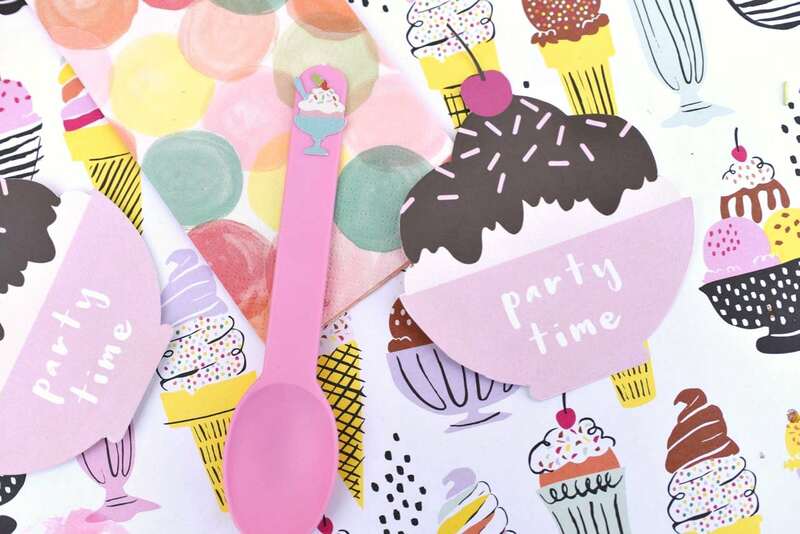 I used the Cricut print then cut feature to create personalized ice cream spoons and cups recently at our ice cream party I threw for my tween daughter. They’re a great way to add our party colors, designs, and themes into your party. The best part? They are so simple! Today I’m sharing exactly how I made the stickers using Cricut print then cut, and I’m sharing the cut file with you too. Step 1. Log into Cricut Design Space to start creating! If you don’t have an account, it just takes a minute to set one up. 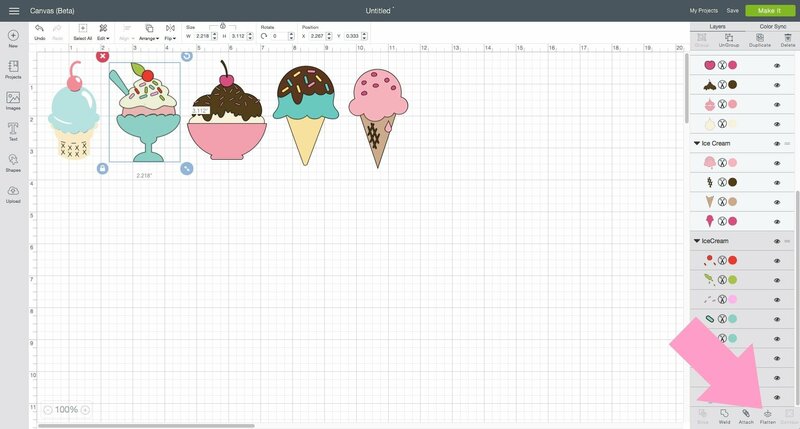 You can also use my FREE 1 “ice cream stickers cut file I already created! Just click HERE. 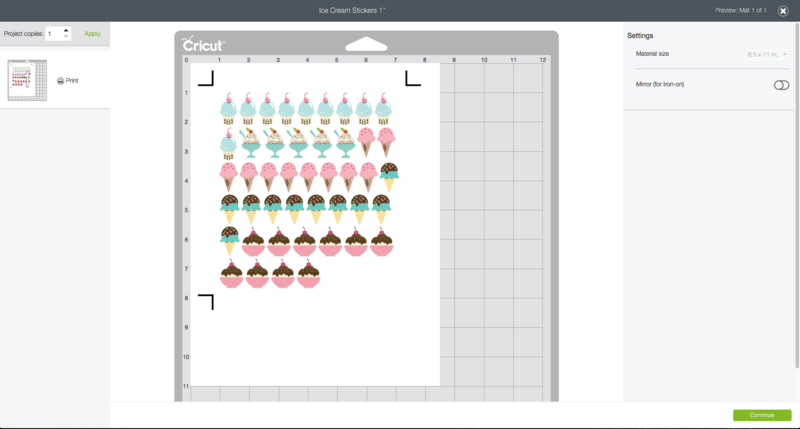 If you just want to download my free ice cream stickers cut file, then skip ahead to step #5. Step 2. In Cricut Design Space, start a new project, then click on the left side of the screen where it says “Images.” Use the search bar in the top right of the screen to find the images you like. I searched for ice cream, then clicked on all the images I liked, then clicked the “Insert Images” button at the bottom of the page. Step 3. Click on each ice cream, then hit the “Flatten” button at the bottom right hand side of the screen. This turns each ice cream into one whole piece instead of a separate cut file for every little piece of the ice cream. Step 4. 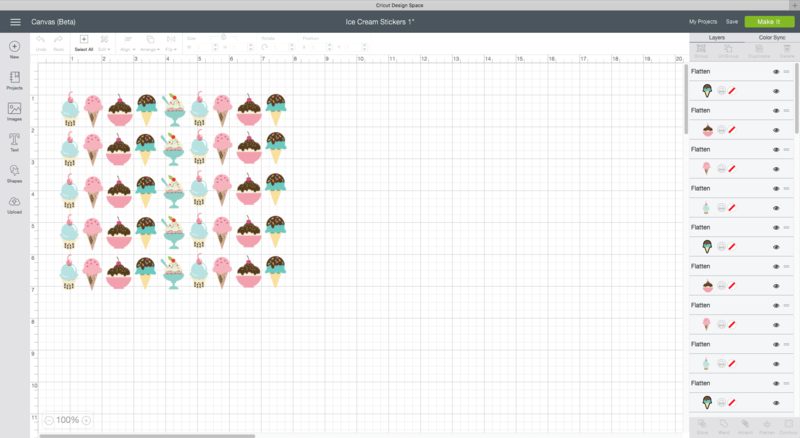 Resize each ice cream by clicking on it, then dragging the right hand side of the box to the size that you like. 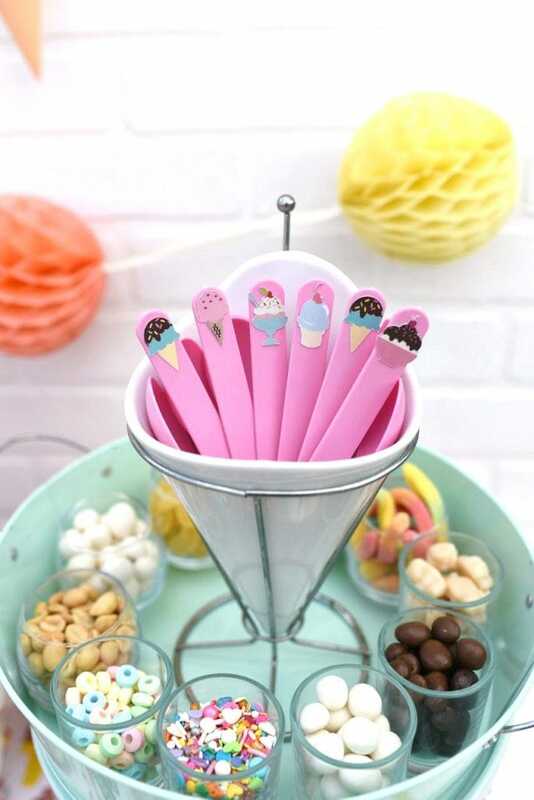 I made each of my ice creams about 1″ so they would fit well on my ice cream spoons and cups. This is an easy way to copy and paste multiple elements in your design, instead of manually copying and pasting each one. Yay for shortcuts! Step 5. Now your design is ready for printing. Click “Save” at the top left to save your project, and save to be a “Print then Cut” image. Click the big green “Make It” button at the top right hand side of the screen. Make sure everything looks good, then click “Continue.” You will be prompted to print the design onto your paper (be sure to load sticker paper if making stickers like I did). Solution #1- Use a thinner brand of sticker paper or buy full sheet labels that are thinner (some readers have recommended Avery full sheet labels). 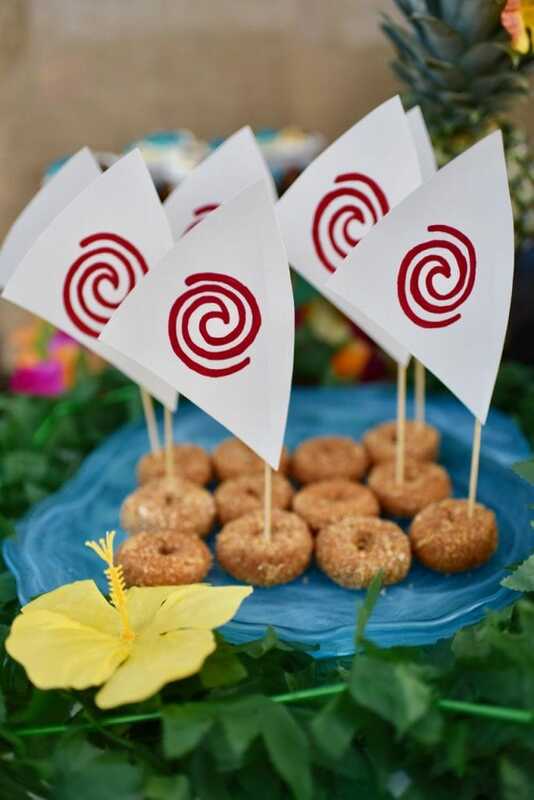 Your printer should be able to handle these without a problem! Just be sure to use a different material setting on your Cricut machine, one that is comparable to the thickness of your sticker paper. Solution #2- If you really want the thicker stickers that you’ll get with the Cricut Sticker Paper (but your printer doesn’t want to print on them), then try taking your sticker paper to a copy shop (I’ve taken mine to Office Depot). There are a few things you have to pay careful attention to though, so please read below carefully for the best results. Be sure to take the pdf file of your project that you’ve saved under “Advanced” when you go to print and cut your design in Design Space. Ask them to make inkjet prints (not laser prints) onto your sticker paper. My local Office Depot has two inkjet printers so this worked perfectly! Your Cricut machine will NOT read a laser printer print, so make sure this is done with an inkjet printer. Also, be sure that the design is printed at 100%. If it’s printed at a different size, then the registration marks on your paper won’t be the right size and your Cricut machine won’t cut accurately. Step 6. After your design has printed, adjust the dial on your Cricut Explore Air™ 2 machine to the right setting. If using the Cricut sticker paper, which is quite thick, then I like to use the “Vinyl” setting. Place your sticker paper on the cutting mat, then load it into the machine by pushing it up against the rollers. Press the flashing “Load/Unload” button. Press the flashing “Go” button to cut your stickers. These stickers are small and intricate, so it will take a few minutes to cut. ** Here’s a little trick ** I cut the design once with the machine, then pushed the flashing button again (without touching the mat or paper) to cut the same thing one more time. 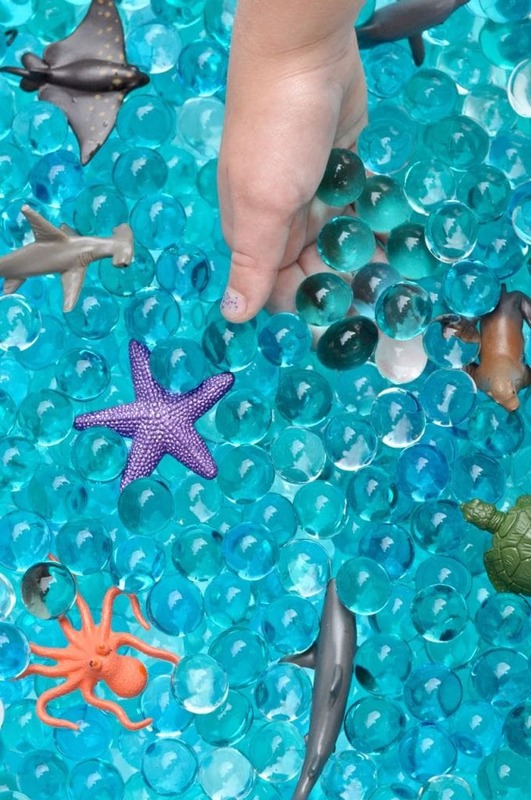 The only trick to this is that you can’t pull out the mat or move the paper at all before doing this! I’ve found that this cuts the stickers perfectly so that the thick stickers are easy to remove from the backing sheet. Aren’t they adorable? It doesn’t get much cuter than tiny ice cream stickers. To decorate the ice cream spoons, I peeled off a sticker and stuck it right on the end of the spoon. To decorate the ice cream cups, get creative! 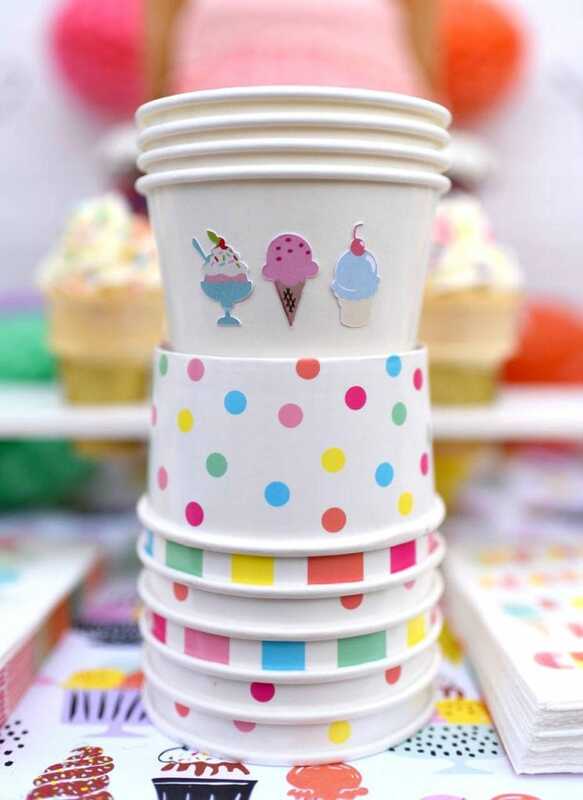 Line the ice cream stickers up in a row on the cups, scatter them all over, or let each party guest get in on the fun and decorate their own cup. I’m so in love with my new Cricut Explore Air™ 2 machine and can’t wait to use it even more! There are SO many creative things you can do with this machine. If you want to win your own brand new Cricut Explore Air 2 machine, be sure to enter the giveaway HERE! 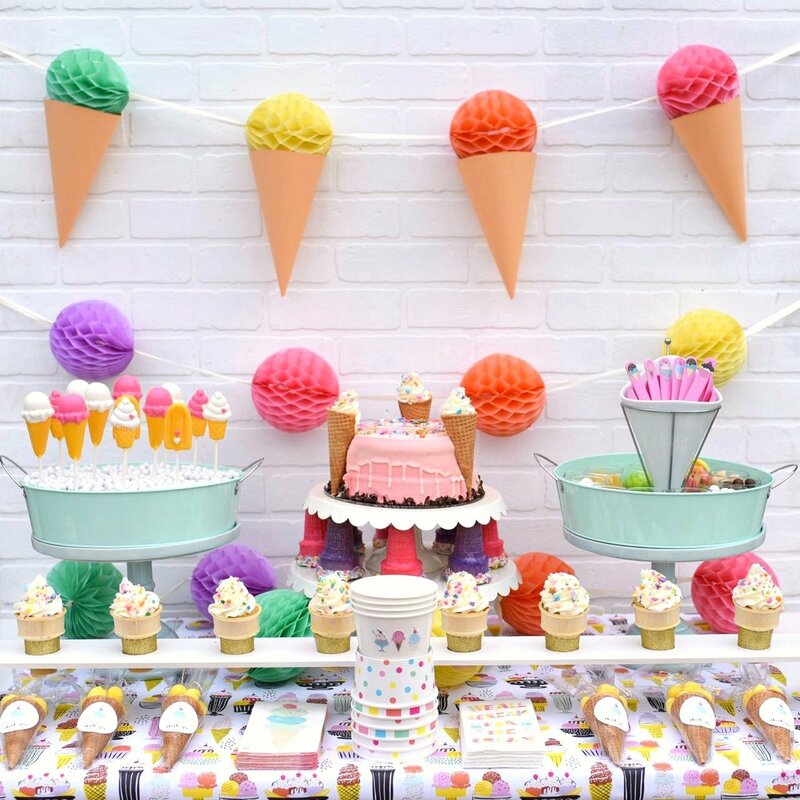 You can see more cute Cricut projects at our ice cream party, plus lots of fun party ideas including a grocery store ice cream cone cake hack, an easy diy ice cream cone garland, a diy ice cream cone stand, and so much more! Those stickers are so cute!!!! 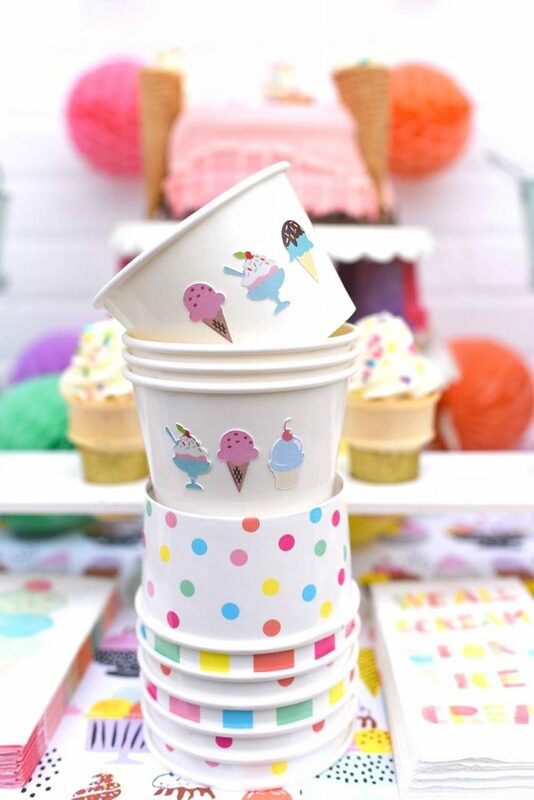 Such a great ways to decorate the cups and spoons. Thanks! I’m working on some labels and I knew there had to be a way to do what I wanted with my Cricut. I just made some refrigerator pickles and now I have super cute labels to put on them before I give to family and friends. Cute! How were you able to create a multi colored vinyl without using multiple vinyl sheets? 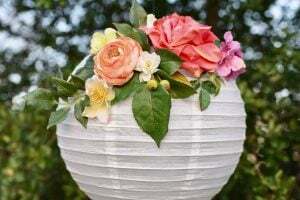 That’s the one thing I am wanting to do on cricut but can’t seem to wrap my brain around how to do so and cannot find any answers online. Did you use ink cartridge or something? Hi Liza! Which proejct were you referring to that has multi colored vinyl? The stickers are made from sticker paper that is printed on and cut with the Cricut machine. It’s called print then cut. You create your design in Design Space, print it out, then the Cricut machine cuts it. It’s a great feature! If you’re having trouble getting the sticker paper to print, you can use thinner full sheet labels from another brand to make your stickers, or take the file and your sticker paper to a copy shop and have them print them for you. Then just take it back home and cut it on your machine. Hope that helps! The Cricut sticker paper is pretty thick and I’ve heard that lots of printers have a hard time pulling them through. Using one of these two work arounds will help! Hi Laura, I’m new to Cricut, I love it, however I have been trying to make a full page of stickers and when I print them out they don’t look good at all, some do. Some look like blobs. One of them had writing on it and it looks like a big blob. I flattened each one, some that I clicked on would not let me flatten. What am I doing wrong here. Hi Judy, I”m sorry to hear that you’re having trouble. 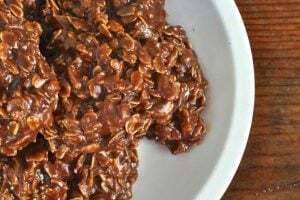 When you say that they look like blobs, is it because the outside of the shapes looks kind of fuzzy and the edges aren’t crisp? If so, then it’s because each image is given a bleed by default, which is a small border around each object or picture that makes the outside of each shape or design look fuzzy. That extra border gets cut off when the machine cuts out your designs. You can turn the bleed off if you like, but Cricut recommends leaving the bleed because it helps with the cutting accuracy. Hopefully that helps you with your problem! I was never able to use the Cricut brand of Sticker sheets for printing and cutting stickers, using my HP Printers. Neither my older HP Photosmart 7510 or my newer HP Envy 7640, feeds it through without jamming. Plus I don’t like the finish of the paper. I have much better luck using Avery full sheet Label sticker sheets or a brand I really like with a glossy finish, LD Premium Inkjet Photo sticker sheets that I get on Amazon. I use the Custom setting of Paper > Sticky Note, which gives a nice kiss cut, and I can remove the stickers from the backing with my finger nail or using the Cricut Pick tool. Thank you for showing your creative use of your stickers and the party you put together. comment posted April 3, 2018. Note too the printable area allowance in Design Space 3 is now 6.75 x 9.25 so a bit larger than it was when when you first posted this to your blog, it changed to that size for all Browsers on computers, and the ipad app in July 2017. Yes, the Cricut Sticker sheets are pretty thick and get stuck pretty easily. I’m glad you found a good work around by using thinner full sheet label stickers. You can also take your sticker paper to a copy shop and have them print it onto your sticker paper, then take it home and cut it with your Cricut machine. Thanks for the heads up about the printable are allowance being larger in Design Space. That’s great news! What printer do you have? Mine has not been printing on sticker paper and keeps jamming up? I have an HP Envy 5540. If your printer is jamming you have two different options. You can either use a thinner sticker paper from another brand, or save the design as a pdf (under advanced options I believe) and have them printed onto your sticker paper at your local copy shop or Office Depot. Mine got stuck a few times so I ended up taking it to Office Depot to have it printed and it worked perfectly! Good luck! Hi! If you don’t mine me asking, what printer do you use to print the stickers first? Thank you so much! Hi Marisol! I used my HP Envy 5540. I LOVE this printer! It can print, scan, and copy, and I use HP Instant Ink with it so I pay just a few dollars a month and HP sends me ink in the email before I run out (the printer knows when your ink is getting low). I’ve saved a TON of money on ink using this printer and Instant Ink. Hope that helps! Thanks so much for this tutorial! I’m finally making my first successful project with my Cricut thanks to your easy to follow instructions. That’s great, I’m so happy to hear that! So happy to help. This is your first project of many, I’m sure. 🙂 There are sooo many things you can make with your Cricut machine! Thanks for the tips. 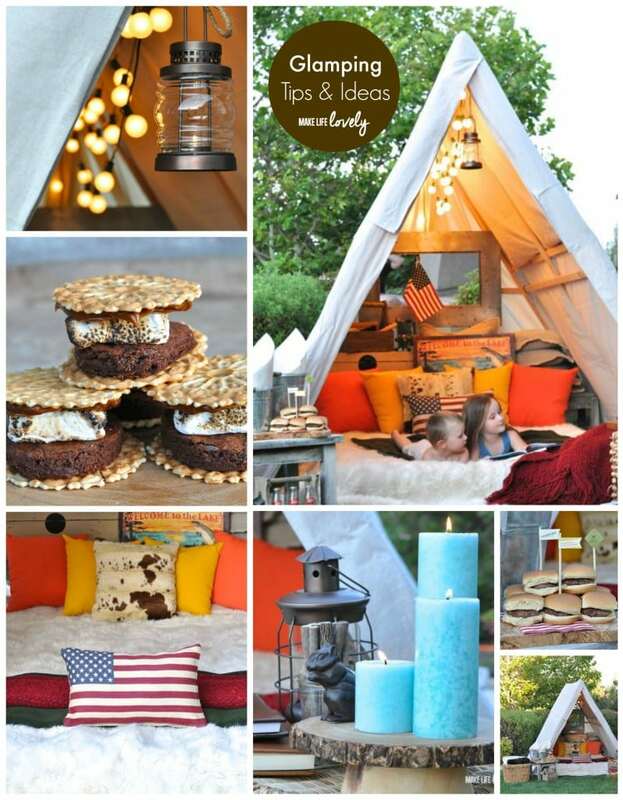 This project is ridiculously cute!!!! Thanks so much Carol! I sure do love those little ice cream stickers too! I make my own product labels on 8×11 glossy sticker paper using photoshop I then have to manually cut them out. They are simple rectangle and circle shapes but do take time to cut them out. Can a cricut machine help me with this? I use my own thinner sticker paper. Absolutely!! A Cricut machine would make this task very easy once you set it up to cut along your labels. The sky really is the limit with this machine!